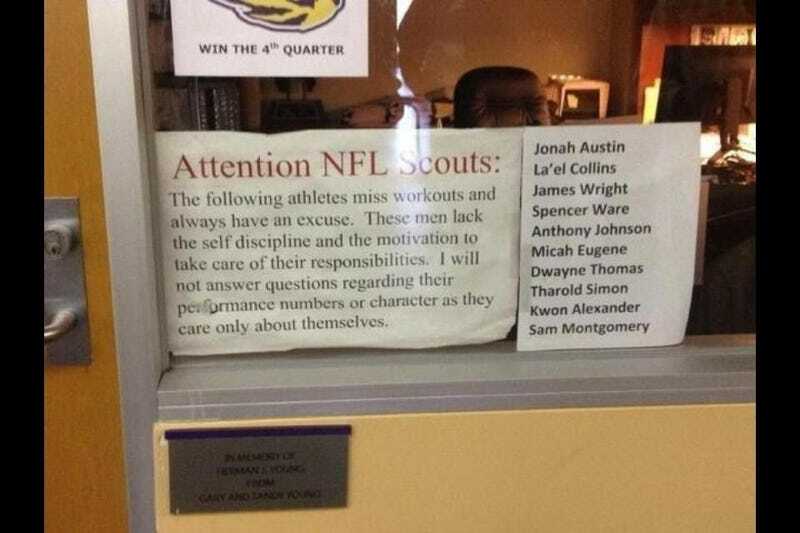 Attention NFL Scouts: The following athletes miss workouts and always have an excuse. These men lack the self discipline and motivation to take care of their responsibilities. I will not answer questions regarding their performance numbers or character as they care only about themselves. That, of course, is an answer to any hypothetical question about the characters of the players in question, and it seems unlikely that if an NFL scout asked Tommy Moffitt, the coach that posted the sign, about the performance numbers of his players, he would tap the sign and decline to answer. Sam Montgomery may well go in the first round. People need to know these things. So it's pretty much just an attempt to undermine and embarrass with players, with specific reference to their job prospects, for missing workouts. Oh, now they're great kids. Moffitt's motivational techniques worked out just fine.